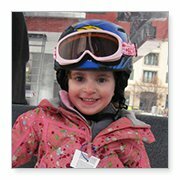 Gabriella Miller - Recipient - The Eye-Bank for Sight Restoration, Inc.
Toddler Able to Enjoy Skiing and Dancing After Cornea Transplants. Gabriella Miller is as outgoing and energetic as her two brothers and quite a handful for her parents Rachel and Scott who would have it no other way. They enjoy seeing their little girl so active because she was born with a congenital eye disease that caused her corneas to be opaque resulting in her being blind. Their daughter’s condition made them fearful about the quality of life she would be able to enjoy. Rachel, who is in the healthcare field, was determined to discover the cause of her baby’s blindness and seek the best possible medical treatment. She began to research pediatric eye diseases and this led her to Gerald Zaidman, MD, corneal surgeon and ophthalmologist. Upon examining Gabriella, Dr. Zaidman concluded that the child suffered from Congenital Hereditary Endothelial Dystrophy, CHED, which has symptoms of corneal swelling and opacity, sensitivity to light and possible involuntary eye movements. He recommended corneal transplants to which Gabriella’s parents readily agreed. 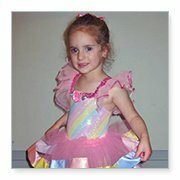 With donor eye tissue provided by The Eye-Bank for Sight Restoration, Dr. Zaidman performed Gabriella’s first surgery when she was two months old, and the second, two months later, both at the Westchester Medical Center, in Valhalla, NY. Without her cornea transplants, Gabriella’s childhood development would have been greatly impeded, but having the surgeries now meant her eyesight could develop normally, particularly through the early stages of life when so much information is received visually.